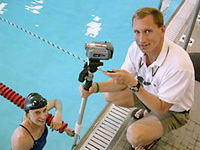 "See It, Understand it, Fix It"
Oceanus Digital Video Swim Analysis helps you see yourself in action and learn techniques to make yourself a better swimmer. Our Digital Swim Analysis combines cutting edge technology with experienced coach-consultants to provide unparalleled insights into swimming stroke performance and suggestions for improvement. We take a deep interest in each swimmer and seek to establish an extended relationship through our services.